Easter is bringing with it another fun team challenge to help you earn SB from Swagbucks! For those of you who don't know what Swagbucks is, it's a website where you can earn cash back on everyday tasks you do online like shopping, answering surveys, discovering deals, and watching videos. You can even earn for searching the web! If you've never tried Swagbucks before because you didn't know where to begin, their Team Challenges are a great way to learn the ropes! 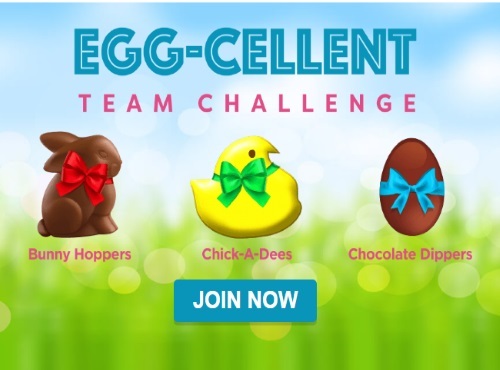 Their latest, the "Egg-cellent" Team Challenge, begins Monday, April 17. 1. Click here to join the challenge and be assigned to a team. Pre-registration is going on right now! If you don't already have an account, you can sign up on this page as well. 2. Starting April 17 at 8am PDT, in addition to earning SB you'll contribute points to your teams total as you complete different activities on Swagbucks. 3. Check back on the page often to see the scores and what you've contribute so far. Not only that, but if you earn 300 SB before May 1st, you'll get a 300 SB bonus (as long as you've signed up under me)! Click here to join a team.